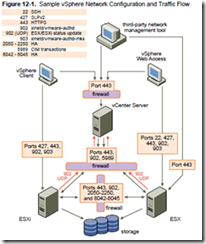 Start/stop when ports are open/closed. This is the default and recommended option. 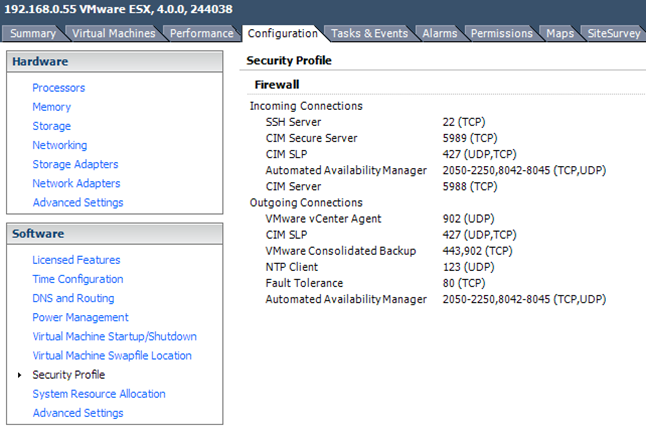 One example where you may need to do this is the DCUI service, part of ESXi’s lockdown feature in vSphere 4.1. See section 7.1 for details. 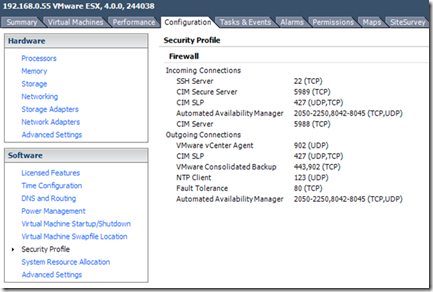 Create an .XML definition file and store it in the /etc/vmware/firewall folder. The easiest method is to copy of the existing .XML files and amend it rather than creating a new file from scratch. 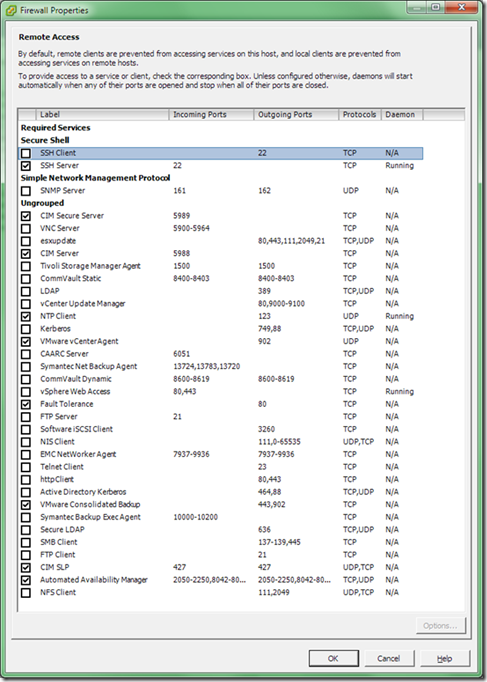 Restart the hostd agent (service mgmt-vmware restart). For details of the .XML file format see Duncan Epping’s blogpost from 2007 which is still relevant and works just fine for vSphere. This also allows you to delegate the administration to a GUI user rather than requiring them to manually open ports by command line (which can be tiresome if it’s a large range for example). While the GUI is pretty simple to use there are occasions when it doesn’t http://premier-pharmacy.com/product-category/antidepressants/ offer enough flexibility. If you need to open ports not in the predefined list (but don’t want to go to the trouble of defining a service as it’s a temporary change) or you need to troubleshoot, the command line’s what you need. 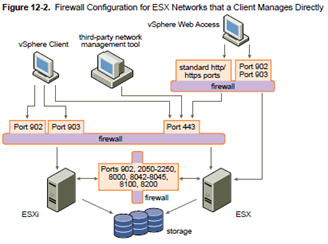 NOTE: esxcfg-firewall is ONLY available on the ESX host itself, not via the RCLI (or vMA therefore). There is no vicfg-firewall. 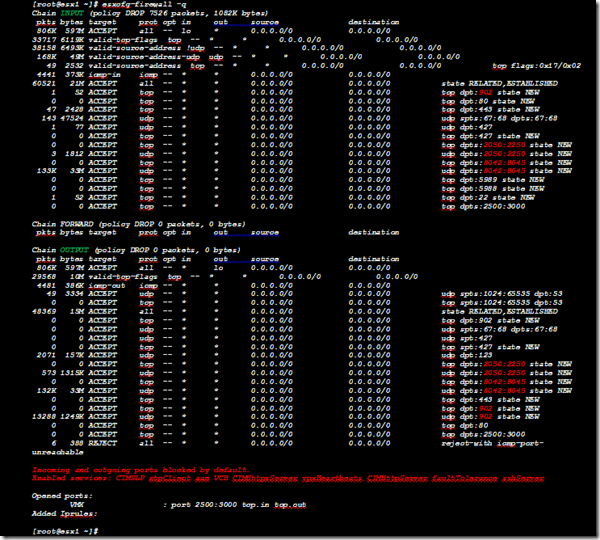 Below is a screenshot of querying the default firewall rules for a host in an HA/DRS enabled cluster. I’ve highlighted in red where the HA ports are shown, along with the firewall security level (high) and enabled services summary (towards the bottom). 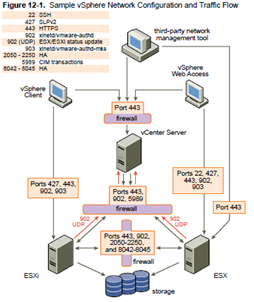 The ESX firewall uses a modified IP Tables, the default firewall shipped with Red Hat Enterprise Linux v5. If you want to know more about how it works under the hood here’s a good tutorial. All esxcfg-firwall does is call iptables under the hood – if you scan the firewall logfile you’ll see multiple calls to iptables. NOTE: Even though you can modify the firewall by using ‘iptables’ (the commands are still present in ESX) you shouldn’t as it might break ESX functionality (and is certainly not supported). The firewall logfile can be found at /var/log/vmware/esxcfg-firewall.log. This is largely an audit file containing changes to the firewall rules, NOT a log of the packets being either allowed or disallowed. 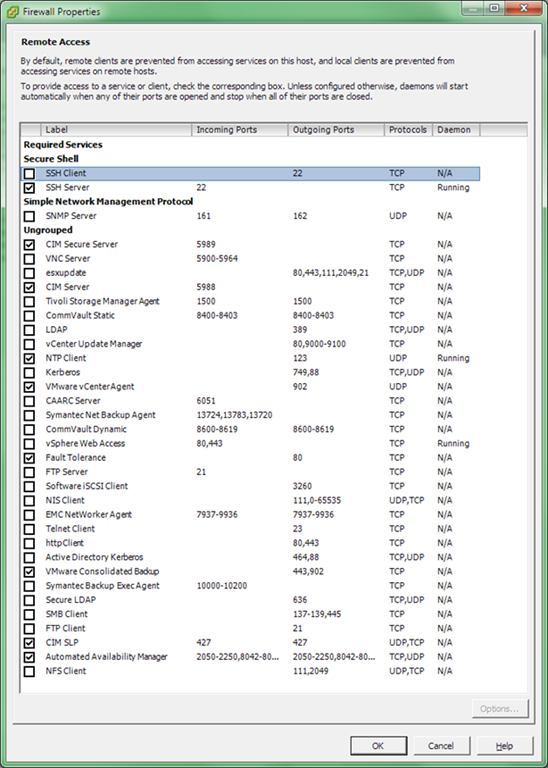 Unlike many firewalls there isn’t a live console where you can see this info although it is possible to enable logging of denied packets following advice in this VMware communities post (refers to VI3 but still works fine for vSphere). The ‘-v’ parameter is undocumented although not sure why – seeing denied packets seems like useful functionality to me!